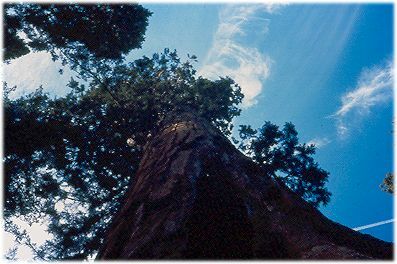 Giant sequoia trees (Sequoiadendron gigantea) are found in three groves in Yosemite National Park. Mariposa Grove, 35 miles (56km) and 75 minutes south of Yosemite Valley, or two miles (3km) from the park's South Entrance Station, is the largest grove of these "big trees" in Yosemite. Mariposa Grove's Grizzly Giant, 1800 years old, is thought to be Yosemite's oldest living sequoia. It is along the Mariposa Grove's main trail, less than a one-mile (1.6km) hike from the parking area. You can take a tram tour through Mariposa Grove from May until October. Mariposa Grove's parking lot is at an elevation (altitude) of 5,600 feet (1700m) above sea level; the grove's giant sequoias range from that elevation to as much as 1,000 feet (300m) higher. The road to Mariposa Grove is not plowed in winter. Lodging and camping for the Mariposa Grove area are available in nearby Wawona and outside Yosemite's border to the south. The Tuolumne and Merced Groves of giant sequoias are near Crane Flat, a 30-minute drive west from Yosemite Valley. These groves, each about one mile (1.6km) from parking, are reached by trails. These trails are also available year-round for hiking or cross-country skiing. Lodging within Yosemite National Park in the vicinity of the Tuolumne and Merced Groves is in Yosemite Valley. Nearby accommodations are also available outside Yosemite National Park's borders. Camping is available all year at nearby Hodgdon Meadow, northwest of Crane Flat on State Route 120 (reservations required only from May through September, tents and RVs). See Yosemite camping outside the Valley for details and reservations. The visitor activities, facilities, and services available at the giant sequoia groves are described in the Yosemite Guide and Yosemite: Your Complete Guide to the Park. The National Park Service has a map of Yosemite National Park on its Web site.